Buttermilk biscuits are the house specialty here at... well, my house. 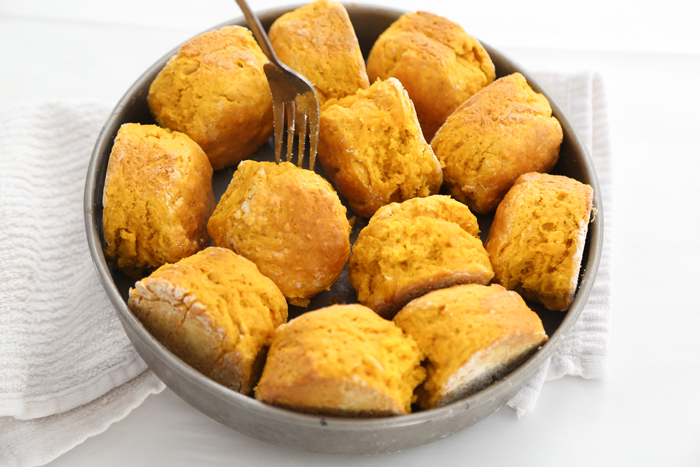 I hardly ever deviate from my grandmother's tried-and-true recipe, but ever since I made these pumpkin crescent rolls, I've been itching to try a pumpkin biscuit recipe. These were such a nice change for us. 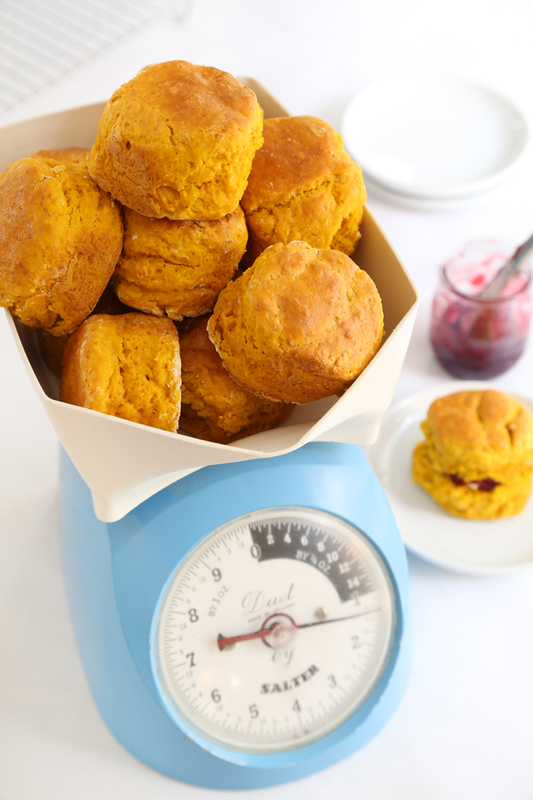 The biscuits have mild pumpkin flavor and I adore their happy golden-orange hue. And boy, are they ever fluffy! If you need an easy scratch-made breakfast for overnight guests (say for Thanksgiving out-of-towners), then this could be it! This recipe was much quicker than I anticipated because it uses few ingredients. 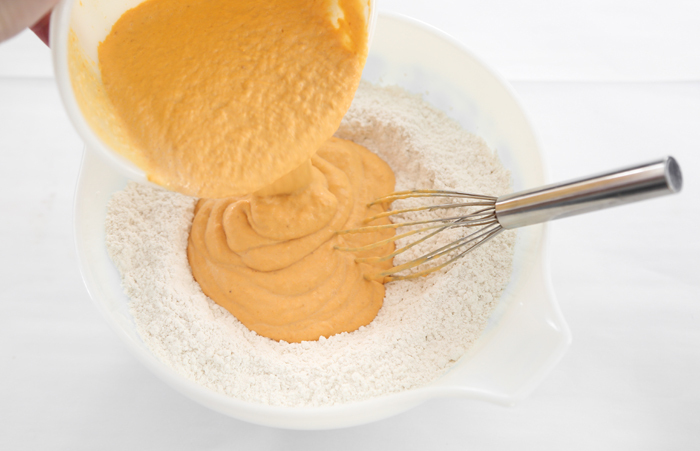 Whisk together the dry ingredients, and in a separate bowl whisk together the wet ingredients. Make a well and pour the wet mix on top of the dry mix; stir together. Turn the dough out onto a floured surface. Cover with more flour and knead about 4-5 folds. Cut the dough into rounds. Don't forget to dip your cutter in flour between stamping biscuits! I covered the cut-outs in egg wash to ensure a golden brown biscuit top! After the biscuits are baked, break them apart and turn them on their sides so the bottoms won't over-brown. I have so many ideas for stuffing these biscuit with deliciousness. My favorite filling so far is red berry jam with a pat of salted butter. Add to this equation a slice of salty country ham and you've got a substantial breakfast (or dinner!). Preheat the oven to 425°F. Spray a 9-inch round pan with baking spray, set aside. 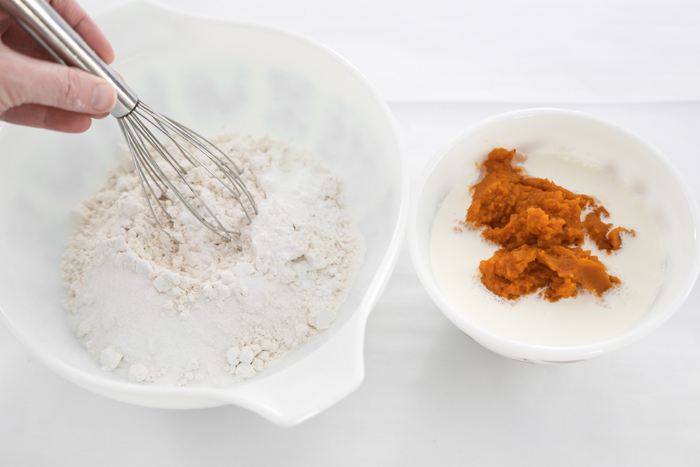 Place the first four ingredients in a large bowl; whisk to combine. Place the pumpkin puree and heavy cream in a separate medium bowl; whisk to combine. Make a well in the center of the dry ingredients and pour in the pumpkin mixture. Stir until the dry ingredients are just moistened. Turn the dough out onto a floured work surface. 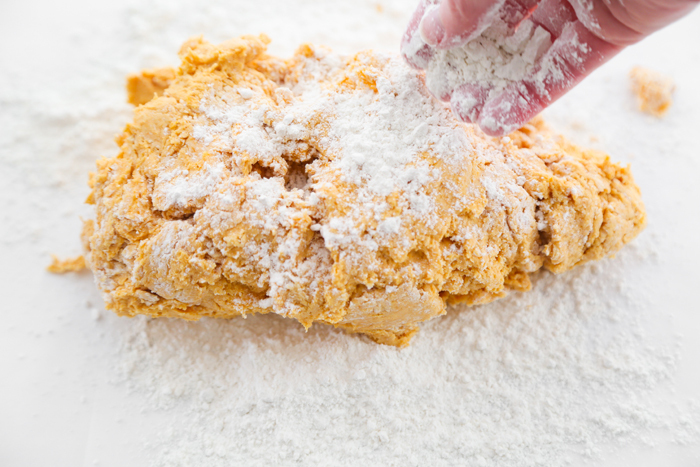 Sprinkle more flour onto the surface of the dough. Knead 4-5 times, and then pat the dough out to 1-inch thickness. Cut the dough into 2 1/2-inch rounds using a biscuit cutter. Place the biscuits, just touching, in the prepared pan. 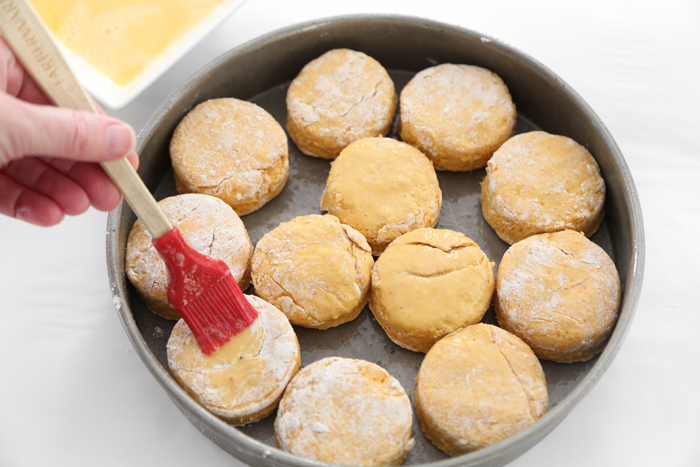 Use a pastry brush to lightly cover the tops of the biscuits with egg wash. Bake for 12-15 minutes, or until golden brown. 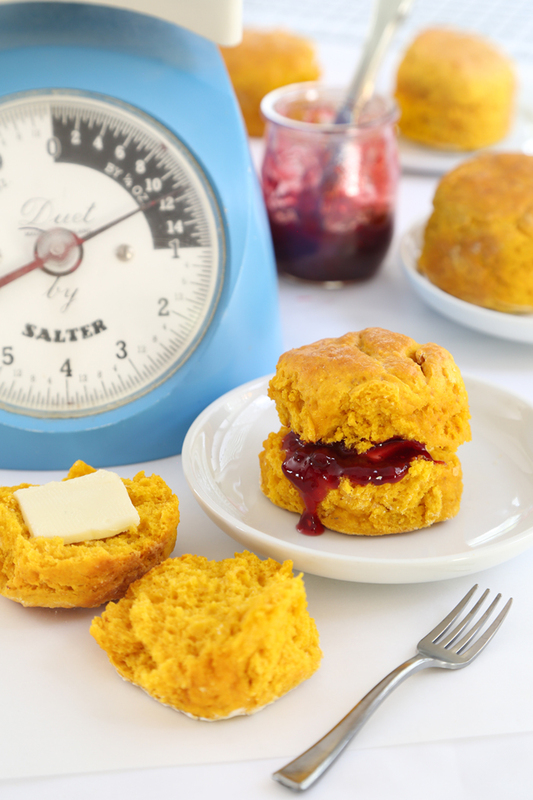 Serve biscuits warm with salted butter and jam. Place leftovers in a zip-top bag or in an airtight container and store at room temperature. Yam variation: Drain a 15 ounce can of yams in light syrup; mash yams with a fork until pureed. Use in place of the pumpkin in this recipe. Increase the heavy cream from 3/4 cup to 1 cup. Proceed as directed. OMG!! Delicious, Thanks for sharing such nice idea. Four Easy Halloween Treats for HGTV!